Over the years I've painted a lot of karri trees. I saw most of them as "tree portraits", each painting trying to capture the character of a tree in a particular location. Ive painted them next to winding tracks, streams and bridges and I've had them side-lit, back-lit and front-lit. Almost all of them were painted from photo references. 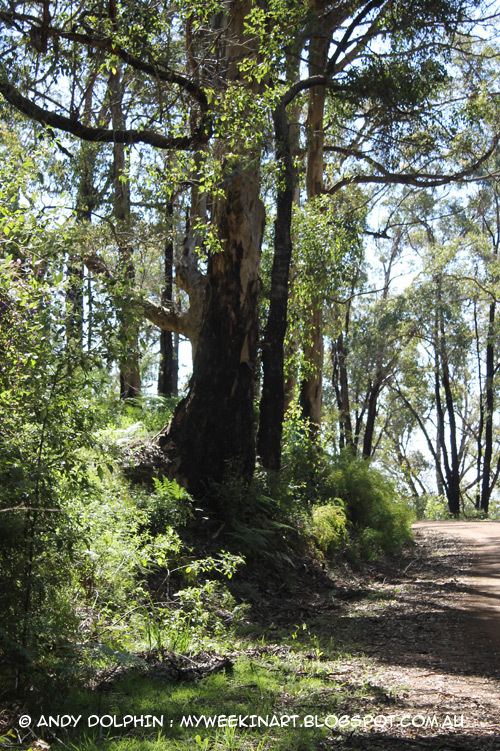 Yesterday, with near-perfect spring weather, I headed out to the Porongurup Range and took a drive through the karri. I was looking for dancing light on some of the granite boulders that populate many parts of the forest but came around one bend and saw sunlight streaming past a large karri perched on the edge of the embankment. I had to paint it! I took a few minutes to consider composition options - how high, how wide, what to leave in and what to leave out. Then set to work. Here's the on-location photo showing the painting almost finished. Here's the "morning after" shot. 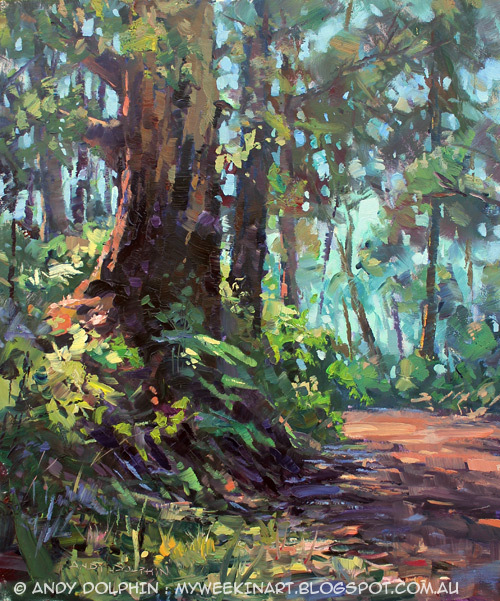 I did very little studio work on this, mainly adjusting a few darks and lights that had gone a little muddy in the plein-air rush. It's painted with a fairly limited palette of French ultramarine, cerulean, permanent crimson, cad yellow light and burnt sienna. I thought I'd take this opportunity to show why photographs are often poor reference material for painting. Here's a shot I took when I began yesterday's painting. Other than resizing for the blog, this photo is straight from the camera. It was taken with a Canon DSLR. It's a reasonable quality camera with a decent digital chip and, while I don't consider myself a great photographer, I do have some idea about how to use it. Professional photographers might get better results, but how many of us are professional photographers? In the photo, everything is either green, "grey" or black. The gravel road, that was positively glowing a rich terracotta, looks dead here. The greens are almost-universally cold and vary more in tone than colour or temperature. There's no hint of the warm spring weather I was enjoying. The shadow from the tree is just a big mass of dark "something" and the sky shows barely a hint of blue. I stood and stared at this tree for over an hour and can assure you, the photo doesn't come close to how things actually looked. Sure there's some exaggeration in my painting but I'm hardly an expressionist. The scene really was filled with colour and warmth. There was texture and detail visible in the dark lower bark of the main tree and the sunlit area at the left-hand base of that tree glowed with rich reddish earth tones - it's what caught my eye in the first place. The canopy of the distant trees was similarly bathed in sunlight - everything back there seemed to be glowing. In fact, I had to tone some areas down in my painting so they didn't compete with my main area of interest. It's spring. If you visit the Porongurups at this time of year, you're greeted with reds, blues, yellows and pinks of wildflowers, yet the photo above gives no hint of this. It could just as easily be a clear winter's day. With a painting, we can include the colours of the spring, even if there don't happen to be any flowers visible in the exact spot we're painting. I can adjust this photo in Photoshop to get it closer to how I remember things but, even then, it lacks useful information. To use it as a photo reference, I'd have to be inventive and to do that successfully, I'd need a lot of experience with the subject matter. And if I didn't look at the photo until month after I took it, would I even remember what caught my eye on the day? History suggests to me that I wouldn't. 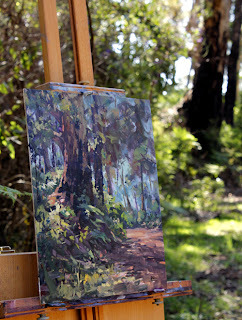 In short, if you can possibly get out and paint on location, do it. It doesn't matter if the individual paintings fail (I did another one after this that I scraped off as soon as I got home). What matters is experiencing nature first hand. I'm getting a lot of spam lately from companies selling cheap reproductions of paintings. I've deleted five comments in two days. The comments are usually repetitious (you'll find identical comments on other people's blogs), and have nothing to do with the articles they're posted to – showing that the person (or robot) posting the comment has no interest in your blog articles but is simply hoping to direct your readers to their own site via free advertising. They hope to trade off your popularity. If you get these comments on your own blog, can I suggest that you delete them too so as not to encourage the practice?